When I first took the RazorMax from myCharge out of it's plastic case I had just returned from a 24 day trip with the family to Spain, France and Belgium. At first glance it's the same size of my old iPhone 4s. Pretty plain looking with not a lot of bells and whistles. Little did I know from that day forward I pretty much don't go anywhere without my RazorMax. Out on the golf course if I'm doing a course review that I have to take lots of pictures and videos or if I'm using a GoPro. The Razor Max is up to the task. With my iPhone plugged into my RazorMax there are no worries that my battery will run out. The anodized aluminum case stands up to walking or if your taking a cart. When golfing if I'm using a GPS they tend to gobble your phone's battery. With the RazorMax you don't have to worry. With a fully charged RazorMax I never had a problem with my phone's battery and my GPS dying. The RazorMax delivers an extra 27 hours talk time for your smartphone. When I'm delivering the mail (my full-time job) I always make sure my phone is plugged into my RazorMax. 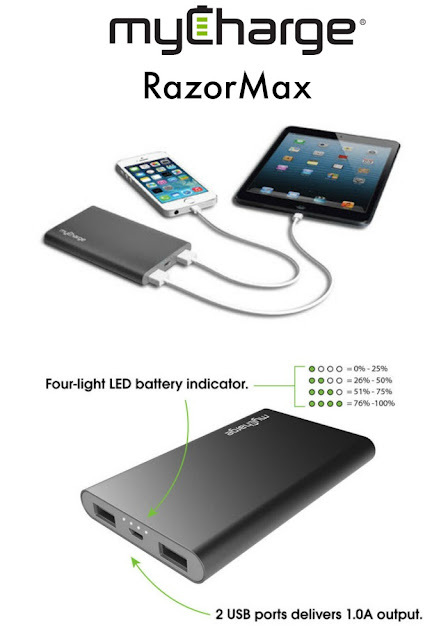 It gives me that confidence that I know I'll always have a charged battery for my phone. The RazorMax retails for $69.99 very reasonable considering I can't live without it. 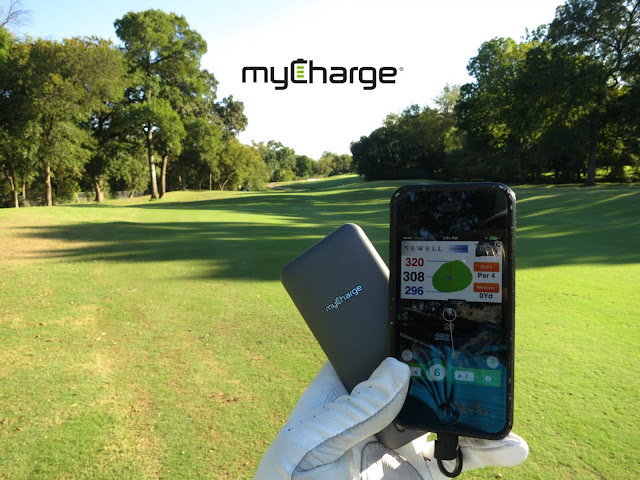 myCharge is a Michigan-based manufacturer of portable charging solutions that has been first to market offering the most advanced solutions for a multitude of needs. Our devices integrate built–in charging cords that emphasize portability and versatility, and powerful lithium polymer batteries that allow you to quickly charge your smartphone, tablet, eReader and other devices so they’re ready when you need them. From power banks to power cases, the diverse set of innovative myCharge solutions ensure you’ll never be stranded again. Ditch your dependency on cables and wall outlets – and let myCharge make your life a bit easier on and off the course!